Stephen Bax ♦ March 15, 2014 ♦ Comments Off on What’s new? See a new post from Darren Worley on a word in folio v77. Thanks Darren. 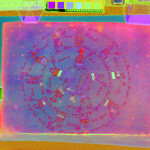 See an interesting new post by Darren Worley regarding the strange symbol on folio 57v. For those who are curious, I notice that this website has now reached more than 200,000 unique visitors since it was started in 2014 (i.e. not counting repeat visits). Of course this is testament to the power and fascination of the Voynich manuscript, and not to my personal allure 🙂 . 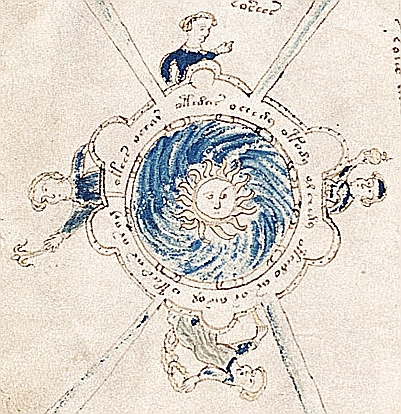 For a quick summary of where I stand on the Voynich manuscript see here. 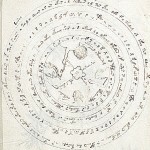 René Zandbergen has kindly contributed this interesting review of a recent discussion of the Voynich Manuscript. 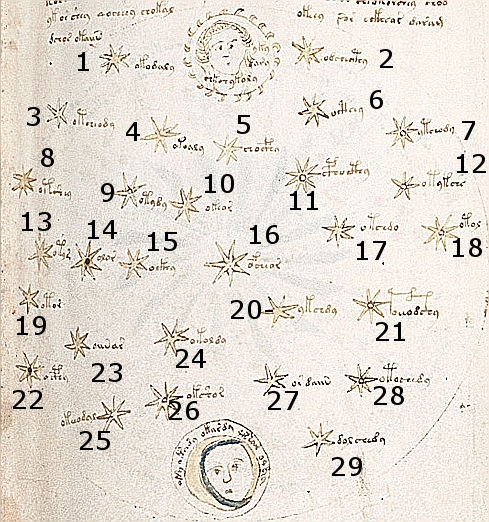 I have also recently added a new post about approaches to decoding the Voynich manuscript. See a fascinating discussion of the ‘Gemini page’, f72r2, written by Darren Worley and Marco Ponzi. See a superb and detailed discussion of the f73v Sagittarius page produced by Marco Ponzi and Darren Worley – many thanks. 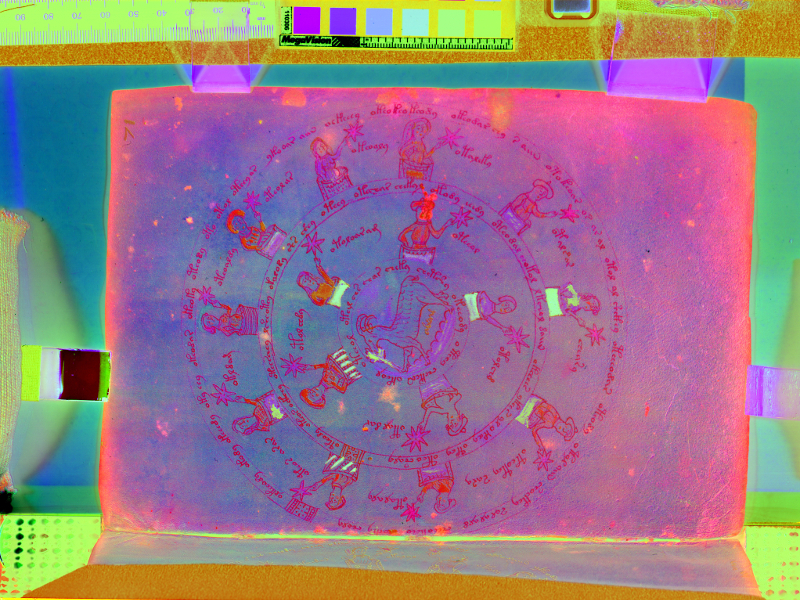 See a ‘multispectral image’ of f71r, one of the Zodiac pages. 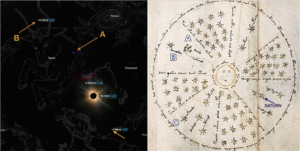 “See this recent discussion by Rene Zanbergen about analysing the cover of the Voynich manuscript. See a new discussion of a possible broccoli plant provided by Dr. Ramiro Gianinazzi. 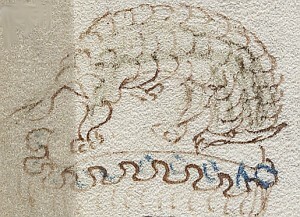 Is this a pangolin on Voynich f80? See a new post with ideas from Jose Serrano. 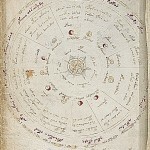 See an interesting discussion by Marco Ponzi on the Voynich Rosettes page. Have a look at this short video with some interesting images of the Voynich manuscript and some commentary by Bill Sherman, a Renaissance scholar and curator of the recent exhibition at the Folger Library. 1. Applied Linguistic research: Find out about my research in general here. Also use the menus above to find out other areas of my work. 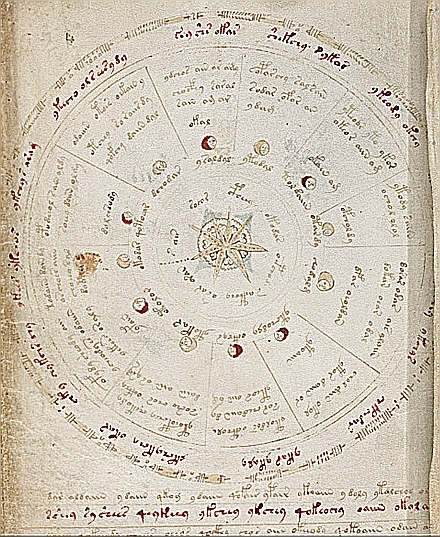 An interesting 14th century Occitan Provencal manuscript with elements reminiscent of the Voynich manuscript. 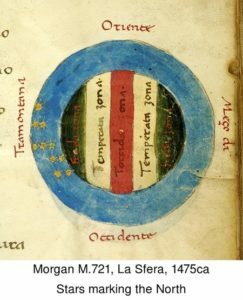 -I've added some interesting new manuscripts to the Herbal Manuscripts list, which offers links to various manuscripts, some of which seem to share features with the Voynich manuscript. - Hunayn ibn Ishaq (809-873) was a Christian Nestorian scientist who translated a number of Greek medical and scientific works into Arabic and Syriac while working in Baghdad. 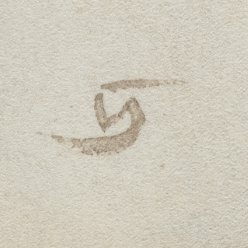 See my list of herbal manuscripts for an article about his translation of Galen, which gives many Arabic and Hebrew names for plants, including 'kharbaq' for hellebore, a word I have discussed in relation to the Voynich manuscript. - More plants added to the list by the Finnish biologist: f65v, f43v, f20r, f24v. 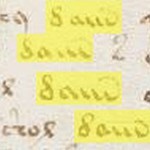 The list now has more than 50 Voynich plants analysed and discussed in detail - thanks to him for his work. You can search through his identifications easily using the search box on that page. 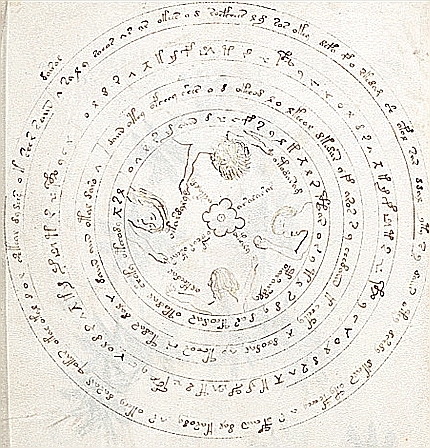 - a video of my talk on 10th April on the script and language of the Voynich manuscript. 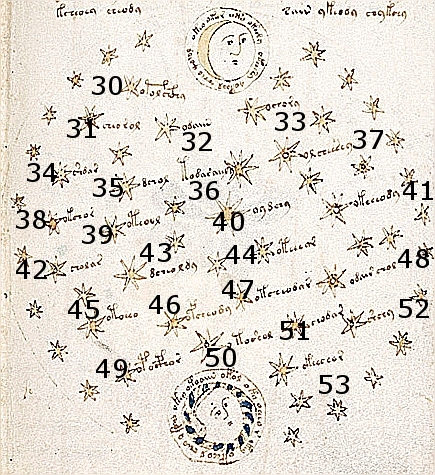 - A new page on Voynich stars 67r with Kelly's interpretation. 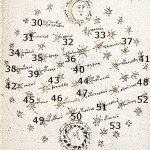 - Voynich stars: Look also at the interesting discussion developing about Voynich stars, with Marco Ponzi's ideas on the 'mansions of the moon', and Voynich cosmology f85r2a new page about Voynich f85r2, based on work by Marco Ponzi, with a convincing interpretation of the images as representing the Four Seasons. 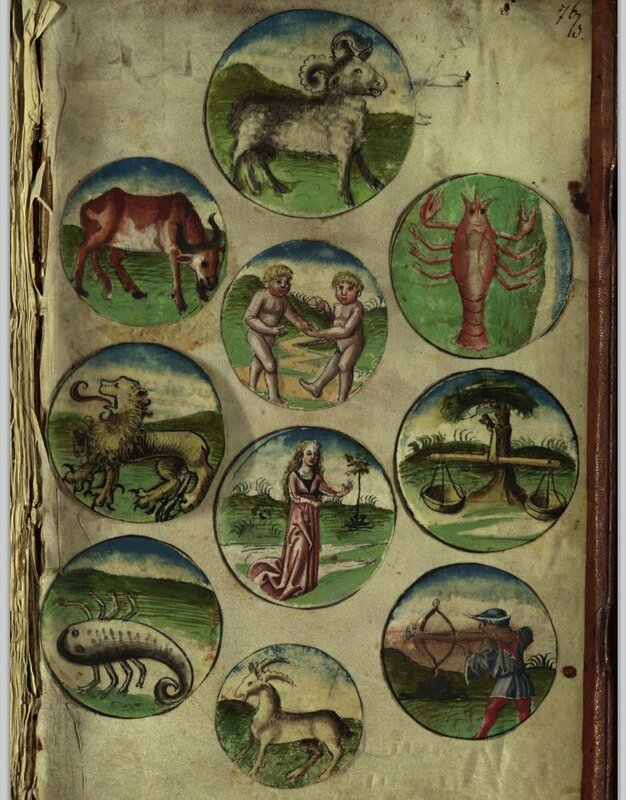 Also see a page examining the Voynich Pleiades page (f68r) with ideas from Marco Ponzi linked to lunar mansions. 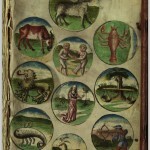 -A new page for discussion of f57v, the 'alphabet page', with ideas from Darren Worley. 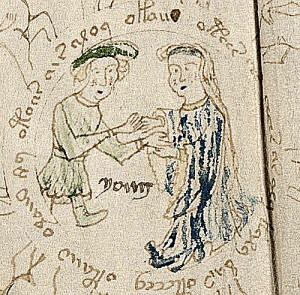 Also, a post with a discussion, also from Darren Worley, about possible Mandaean links with the Voynich manuscript. 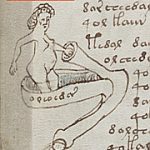 – Voynich plants: See a detailed and professional discussion of Voynich plants contributed by an anonymous Finnish biologist. 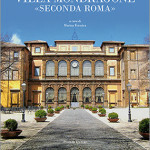 In my view this should be required reading for anyone interested in the plants in the Voynich manuscript. To my mind it gives a fascinating new insight into the mind of the people who created the plant drawings. 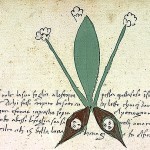 Then look at the extensive and expert discussion of specific Voynich plants by the same author. More added recently. Thanks to him for his work. 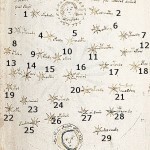 – I have now created a section devoted to Mediaeval herbal manuscripts and another small one on Voynich stars which you might find interesting. – Following my provisional identification of a number of plants and proper names in my Feb 2014 paper, I have now added two more provisional identifications and names. See my full analysis of page 6v, with a proposed identification of the castor oil plant, Ricinus communis, together with analysis of the first word of the page as relating to, and perhaps deriving originally from, the Arabic. 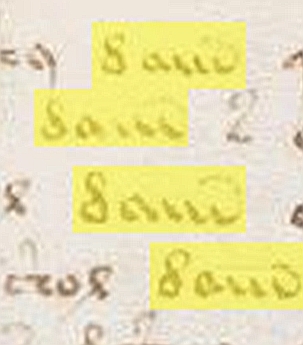 Secondly, see a possible identification of the Marsh mallow (plant 5v) (Althaea officinalis) with a name in the Voynich manuscript which appears possibly to derive from Persian. This second still awaits more detailed research but I feel it is a strong possibility. – I’ve now posted an area for discussion of Voynich plants, to get your feedback on the plants and their possible names.